Tread in the footsteps of the Incas throughout this awe-inspiring Peruvian journey. We'll hike the storied Sacred Valley and its ancient site—Ollantaytambo, Sacsayhuaman and Tambomachay—meeting the Cuyuni people along the way and learning about traditional life in the Andes. We'll ascend to the valley's crowning glory, Machu Picchu, either aboard a panoramic Vistadome train or by hiking the legendary Inca Trail. We'll end our unforgettable trip in lively Cusco where modern Peru collides with its pre-Columbian and Colonial pasts. No reviews yet for this trip. Browse other reviews below for VBT Bicycling and Walking Vacations. Never expected such a wonderful trip. Well planned and executed. Group was wonderful. On my way home after a terrific VBT vacation...Tuscany by the Sea. Our group was terrific and our guides Oliver & Elenna (?sp) were wonderful ! This was my first but won't be my last ! The Tuscan Coast Tour, starting mid September was a phenomenal excursion. The guides Franco and Christian, were experts in cycling, language, culture, and good humor. Each and every member of the group had something to offer all of us, with kindness and enthusiasm. Tuscany is beautiful, hospitality, food, scenery, and sunshine over the top! Just returned from a fabulous walking vacation in New Zealand's South Island. Our guides Jan and Ross were the best ever! I can't say enough about the great choices of lodges, dining experiences, and visits to outstanding wineries. And the hikes had some pretty spectacular views too. I'm not a very strong hiker but Jan and Ross always made me feel comfortable and Jan even took care of my blisters! It was a great experience all around! Just finished the Charleston-Savannah trip and I can't say enough good things about it. Our guides, Abby and Sarah were over-the-top wonderful. They were always helpful, professional and knowledgeable about the areas we visited, bikes and just NICE people. The lodging was excellent, food included was delicious and I really enjoyed the places we visited and cycled by. Just finished the Wine Country Tour.......our 3rd tour with VBT!!!! The scenery was fabulous, as was every other aspect of the tour....our guides Dan & Diana did a tremendous job of planning....making everything seamless for our group! No surprises at all....was our VBT (Very Best Tour)!!!! VBT No-Air Package guests: Meet your VBT Trip Leaders at the Casa Andina PC Cusco at 8:00 am. The contact information for the Casa Andina PC Cusco will be confirmed in your final documents. Please contact the Casa Andina PC Cusco to advise them of any travel delays or changes so the staff can pass the message on to your VBT Trip Leaders. We will have a short orientation during our shuttle ride (approximately 1.5 hours) to the start of our warm-up walk in the Sacred Valley. Please be dressed in your walking attire for your warm-up walk this morning when you meet your Trip Leaders. VBT Pre-trip Extension and Air Package guests: Meet your VBT Trip Leaders at your Cusco hotel at 8:00 am. We will have a short orientation during our shuttle ride (approximately 1.5 hours) to the start of our warm-up walk in the Sacred Valley. Please be dressed in your walking attire for your warm-up walk this morning when you meet your Trip Leaders. We depart Cusco and shuttle to the start of our morning walk, which will give us the opportunity to experience local life as it unfolds in the peaceful Andean Highlands. We begin our walk along the ancient farming paths in this primarily agricultural community. We will make various stops throughout our walk today to learn about local farming, religious ceremonies and textile production in this region. After an included lunch, we descend to the Sacred Valley (7,841-foot elevation) and continue to the town of Pisac. Here we'll visit a local market where we can view the diverse fruits and vegetables, including some of the 4,000 varieties of potatoes grown in Peru. We'll also have a chance to interact with the vendors as they barter their wares. If you didn't pack a smaller bag to take with you to Machu Picchu, this is a wonderful place to pick up a bag to use. Tonight, enjoy a special welcome reception and dinner at our acclaimed inn. Please note: Due to the logistics of getting to Machu Picchu, there are restrictions on what luggage can travel with you. Please be sure to pack a lightweight, expandable bag that can be packed within your luggage. You will need to transfer only what you need for these two overnights from your large suitcase. 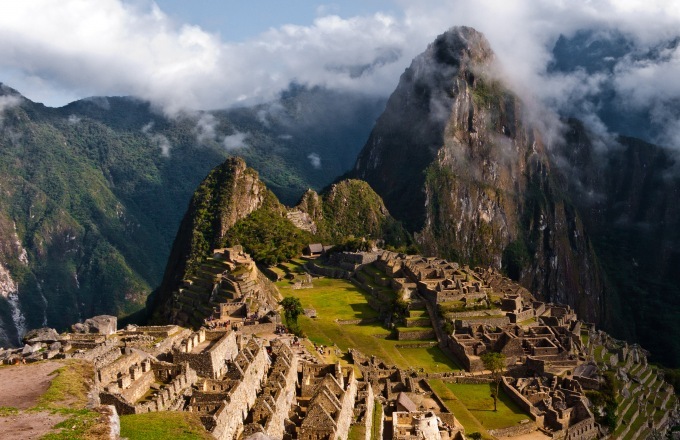 Your large luggage will remain in secure storage during your stay in Machu Picchu. In addition to this duffel, you are able to carry your day pack with you. Daily Options: 3.8 miles on descending, rolling dirt roads and paths. After breakfast, we shuttle into the Andean countryside, where we will walk scenic footpaths downhill to Maras village and the Maras salt mines, which are fed by underground saltwater springs. The terraced Inca salt pans of Salineras are still mined for salt using methods unchanged over centuries. From here, we continue to walk downhill to the Urubamba River, where we meet our shuttle to the hotel. We have the remainder of the afternoon to relax in our comfortable accommodations, built around a former monastery, before we drive to a typical Andean chicheria for dinner and an opportunity to sample some of the region's more unusual (but commonly consumed) food and drink, including chicha (corn beer). Options: 4 miles on descending dirt roads and paths. Today we walk from our hotel to the ancient Inca town of Ollantaytambo. Called just “Ollanta” for short, it is best known for its fortress perched above the village, the site of an Incan victory over the Spanish. The village is one of the few in Peru that still maintains the Inca system of urban planning. You'll feel as though you've stepped back in time as you wander the cobblestone streets. Homes and streets here have not changed dramatically since Incan times. Enjoy one of the typical village restaurants during your lunch at leisure before we shuttle back to our hotel. Tonight, enjoy dinner on your own at the hotel or one of the restaurants in the nearby town of Urubamba. Daily Options: 3.3 miles on flat dirt roads and paths. We shuttle early this morning to Ollantaytambo to catch the narrow-gauge Vistadome train. Our train ride is down the narrowing valley, which offers breathtaking views of the river and surrounding peaks. Those who have elected to hike the Inca Trail will disembark at the “Km 104” marker (7,183 feet) to start one of the world's most iconic walks. The walk offers spectacular views of the surrounding mountains, cloud forests and an unforgettable entry into the Machu Picchu Sanctuary. Expect to be on the legendary trail for five hours with a mostly continuous ascent. An elevation gain and loss of about 2,000 feet and some steep stair climbing will keep you on your toes. Note that a minibus support van will not be available on the Inca Trail. You will be required to walk the entire 8 miles. A picnic break is well deserved. All your effort is rewarded when you arrive at Intipunku, the Sun Gate (8,954 feet)—the most spectacular approach to Machu Picchu from above. This was the original entrance to the “Lost City.” Take some time to take it all in! Then, continue down to our hotel located below Machu Picchu. You'll have all of tomorrow to discover the wonder of Machu Picchu, both with your Trip Leaders and independently. For those looking for a less strenuous option—and for those unable to obtain a permit for the Inca Trail—you'll stay on the train past Km 104, arriving in Aguas Calientes in the late morning. Check into the inn and have an included lunch. You may wish to take advantage of the spa services, or walk the incredible orchid gardens at the inn. You may also take the bus up to the main entrance of Machu Picchu and hike in to meet the rest of the group, or just walk the site at your own pace. Daily Options: 6 miles on flat to rolling dirt roads and paved paths. Today is yours to explore at your own pace. Early morning options include birding on the hotel grounds and taking the shuttle up to explore Machu Picchu as the sun rises—and before the day trippers arrive from Cusco. Shuttle buses operate on a regular schedule from our hotel to the ruins and back. Trip Leaders will be leading a number of guided walks around Machu Picchu, as well as in the surrounding area, including a roundtrip walk to Inca Bridge (1.8 miles) and to Mandor Waterfalls (4.3 miles). Enjoy lunch at your leisure at the café near the entry gate, in one of the restaurants in Aguas Calientes or at your hotel. Return to the hotel whenever you like. You may wish to continue your exploration until dusk, or return to the hotel by shuttle bus or on foot (2,000-foot descent). Enjoy recounting the day over an included dinner tonight. Daily Options: Only Machu Picchu: 2 miles up and down stone stairs and dirt paths. Additional Inca Bridge: 2 miles up and down stone stairs and dirt paths. Additional Mandor waterfalls: 4 miles up and down stone stairs and dirt paths. Enjoy a relaxing breakfast. Several walking trails begin right at the hotel, or you may wish to visit the tea plantation located within the hotel grounds. Later this morning we return to Cusco through the Sacred Valley by Vistadome train. Upon our arrival in Cusco this afternoon, we will put on our walking shoes and discover this ancient Inca capital with a walking tour. Evidence of both the original Inca city and the Spanish colonial city established in 1533 will be pointed out as we explore Koricancha (“Temple of the Sun”), Cusco Cathedral and the San Blas district. In Incan times, San Blas was a settlement for ancient craftsmen who saw “yachay”—Quechua for “teach and learn”—as their special calling. Today, the area is famous for the unusual Baroque-style pulpit in the San Blas Church and for its artists and artisans. Cusco and its many dining options are at your doorstep tonight. Daily Options: 1.5 miles on descending cobblestone and paved pedestrian paths. After breakfast, we transfer six miles (25 minutes) north of Cusco to begin our day. We'll trace our way on foot back in the direction of the city, visiting the most important Incan monuments. This is a spectacular area for our walks, with Andean mountain views, colorful villages and impressive remains of the Inca Empire. First we visit Tambomachay (the highest elevation of the day at 12,500 feet), which may have fulfilled an important religious function linked to water and the regeneration of the land. Walking down a gentle slope, we'll later stop to explore the complexes of Puka Pukara, Qenqo and Laqo. Our Trip Leaders can explain more about historic religious ceremonies held here. We find a comfortable meadow overlook to enjoy a picnic lunch, and learn about the survival of some pre-Hispanic rituals and their impact on Andean life, too. After lunch, saving the most impressive for last, we visit Sacsayhuaman. Though only a fraction of its original size and scope, this fortress will astound and baffle you. We take a moment to look back over the orange tile rooftops of Cusco before our short transfer into the city. There is time to soak in some last bits of Andean culture in the colorful plazas of Cusco. Tonight, we're out on the town for a festive dinner. Daily Options: 4.5 miles on flat to gradually descending dirt roads and paths. Our tour finishes in the hotel after breakfast this morning. The hotel will help you book a taxi at your own expense to the Cusco airport. A beautifully renovated 18th-century manor house, just three blocks from Cusco’s Plaza de Armas, Casa Andina PC Cusco is replete with authentic colonial character. It offers the intimacy of a boutique hotel but the comforts and services of a much larger property. The hotel is distinguished by its three interior patios with wooden balconies. The principal patio, featuring a gurgling stone fountain, is one of Cusco’s emblematic colonial courtyards. In the hotel’s cozy lounge and reading room is a massive stone fireplace that’s always crackling, while the romantic restaurant invites guests to dine by candlelight in one of four connected salons richly decorated with 18th-century Cusco School paintings. Several rooms in the original structure of the hotel feature surviving colonial frescoes unearthed during renovation. Inkaterra Machu Picchu Hotel is a pueblo of luxurious whitewashed bungalows nestled into terraced hills. The train station is only steps away, but the ambiance at the Inkaterra Machu Picchu Hotel seems to exist in a world apart. It is an intimate 85-cottage luxury hotel designed in the manner of a sprawling Andean-style village on 12 secluded acres of exquisite beauty. Guests follow stone pathways to their rooms, located in comfortable one- or two-story whitewashed casitas. Spa services use natural essences, and a first-class restaurant offers grand views of the Vilcanota River. Located in the heart of the Sacred Valley of the Incas and surrounded by beautiful gardens, this is the Sacred Valley's most complete hotel. A mountain chalet-style retreat with panoramic Andes views from every room and every angle, this charming 85-room hotel is a one-hour drive from the ancient Inca capital of Cusco and close to Machu Picchu. The property features eight acres of landscaped gardens, a domed planetarium with an observatory for stargazing at the southern-hemisphere sky, and a full-service spa. The Wyndham Costa del Sol Lima at Jorge Chavez Lima-Callao International Airport is a beautiful 130-room hotel. Each guestroom features a 26-inch LCD TV with cable, complimentary wireless Internet access, marble bathroom with tub and shower, individual climate control, minibar, in-room safe, and hairdryer. With its stylish contemporary design, cutting-edge technology and ideal location, the flagship Casa Andina Private Collection Miraflores hotel is the top of its class in every aspect. Formerly the Miraflores César's—Lima’s fondly remembered, original 5-star hotel—this modern icon was dramatically transformed in 2008 into the capital’s newest luxury hotel. In both its public spaces and its private rooms, a quintessential Limeño flavor resonates in an exquisite collection of works by contemporary, local artists and its prized colonial-era antiques. The 17-story hotel, with views over Miraflores and the Pacific coast, offers 148 sophisticated, contemporary luxury rooms and suites, with soundproofing and LCD flat-screen TVs in every room. First-class amenities include a heated, covered pool and breezy terrace, gymnasium with the latest exercise equipment, and the prestigious Joop salon and massage room. Reserva Amazonica Lodge is located in a private reserve, surrounded by a vast jungle canopy. You’ll awaketo tropical birdsong, and end your day by lantern light, falling asleep to the lulling soundof the Amazon rainforest. Exotic yet accessible, Reserva Amazonica Lodge provides an unforgettable introduction to this remarkable region of incomparable biodiversity.